On March 5, 2016, Louisville City FC began their sophomore season competing in the United Soccer League; the third tier of professional soccer in North America. The United Soccer League falls behind Major League Soccer and the North American Soccer League and is equivalent to Double-A baseball. 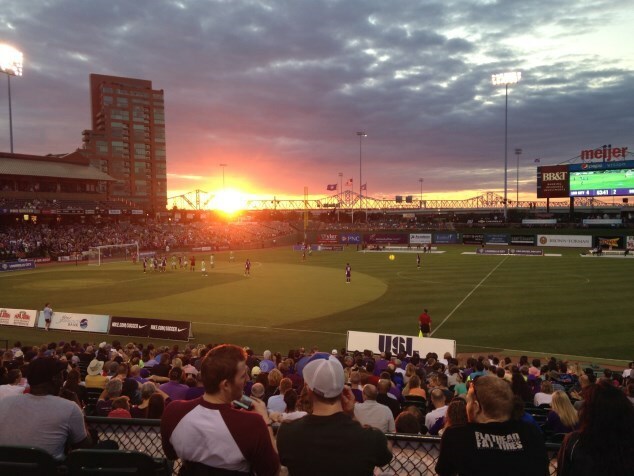 When Orlando, Florida decided to field a team in Major League Soccer, principal owner of Louisville City, Wayne Estopinal, acquired the license to move the team to Louisville. Louisville has a history of professional sports going back to the 1870's when Louisville was host to a National League Baseball team. In 1921, Louisville fielded the Louisville Brecks in the American Professional Football Association, which was renamed the National Football League in 1922. Louisville has also hosted several minor league ice hockey teams. Most famously, between 1967-1976, Louisville hosted the Kentucky Colonels of the American Basketball Association. In their inaugural season, Louisville City was extremely successful. At the end of the season, they were ranked second, among the 24-team League, in both the Eastern Conference and league overall. They may it to the Conference Finals, in the playoffs, losing to eventual League champions Rochester Rhinos. Matt Fondy and Bryan Burke helped the team to their second place finish. Matt Fondy was named the Most Valuable Player of the League, as well as winning the Golden Boot Award, top league scorer, with 22 Goals. He was also named the USL Player of the Week four different Weeks. Bryan Burke was named Defender of the Year and the Assists Champion. The Louisville Bats share Louisville Slugger Field with Louisville City FC. Slugger Field can seat 13,131 for baseball, but because of the configuration of the baseball diamond, 8,000 people is considered a sell-out for the soccer field configuration. The pitcher's mound was fitted with a jack so it can be raised and lowered as needed. The league's attendance has grown, since their inception in 2011, where the league average was 2,274 people, to a league average of 3,369. Louisville's average attendance was more than twice that 6,765, which was second only to Sacramento. The supporters group harkens to the state's bourbon and are called the Coopers, which is the name for barrel-makers. They are seated in sections 121-124 and chant and sing the entire game. Come join the Coopers and the other fans to cheer on your local soccer team. If you can't make it to Slugger Field, all United Soccer League games are broadcast, live on the USL's, YouTube.com channel. The season officially begins with an away game against the Charlotte Independence on March 26th, 2016, but has their home opener on April 2, 2016. However, the team does have two more preseason friendlies against both the University of Louisville and the University of Kentucky on March 10th and 16th respectively.